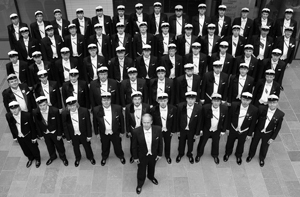 One of Finland's finest male voice ensembles, The Polytech Choir (Polyteknikkojen Kuoro) was founded in 1900 by male students of engineering or architecture. It has successfully participated in a number of domestic and international choir competitions and continues to fulfuill a very active schedule of concert and touring activities. The PK's repertoire embraces both the traditional male voice choir music and numerous works by contemporary composers, including many commissions. The Polytech Choir has been led by Juha Kuivanen since 2004.